Lychgate, stable and churchyard wall of the Church of Saint Baglan. 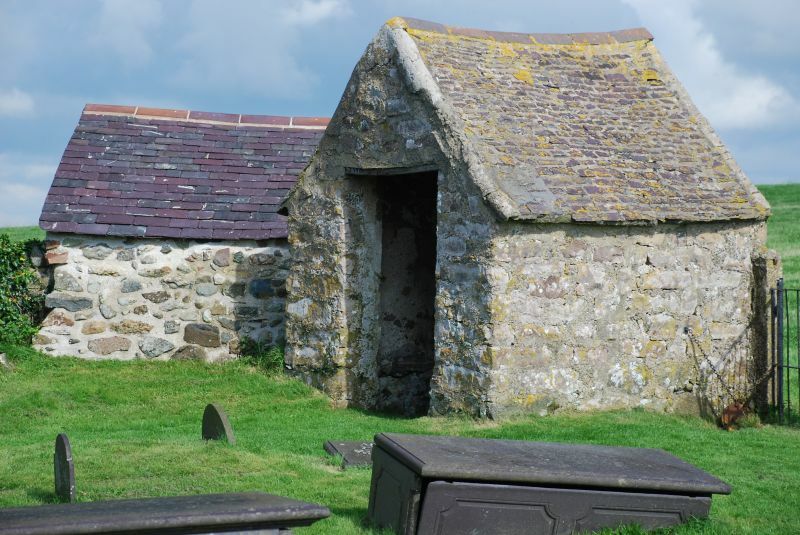 Entry Name: Lychgate, stable and churchyard wall of the Church of Saint Baglan. Location: Situated NW of Llanfaglan, in an isolated situation in a field some 150m E of the minor road which runs N - S along the edge of the Afon Gwyrfai estuary. Churchyard of C13/C14 church. The Church was originally a chapel of Llanwnda and annexed to Clynnog-fawr. The churchyard wall is of uncertain date, the lychgate is dated 1722, and the stable is probably C19. Wall enclosing roughly rectangular churchyard, of drystone rubble construction. Main entry is on the N side near the E end. Double wrought iron gates with square stone pillars, the gates with dog-bars and curved strengthening rails. To the W of these is a pedestrian gate attached to the SE angle of an enclosed lychgate facing NE. This is of square plan, rubble stone with grouted slate roof. Plain square headed doorway each end with timber lintels. The outer doorway has a rough plank door not to full height. A plaque above the lintel in the outer gable is inscribed 'HL / IH / WARDENS / 1722'. HL is said to be for Hugh Lewis. Each side of the interior has a stone seat, one with oak board and one with a slate slab. The former stable adjoins the lychgate at an angle to the W. Small rectangular building of rubble stone with low-pitched slate roof. The single doorway faces E and has a boarded door with timber lintel. An unusual dated C18 lychgate, and gate with stable, churchyard entry and wall form a picturesque group with the Church of Saint Baglan. Situated at the end of a minor road some 850m NNE of the church in Llanfaglan. Situated at water edge directly to east of Fort Belan.